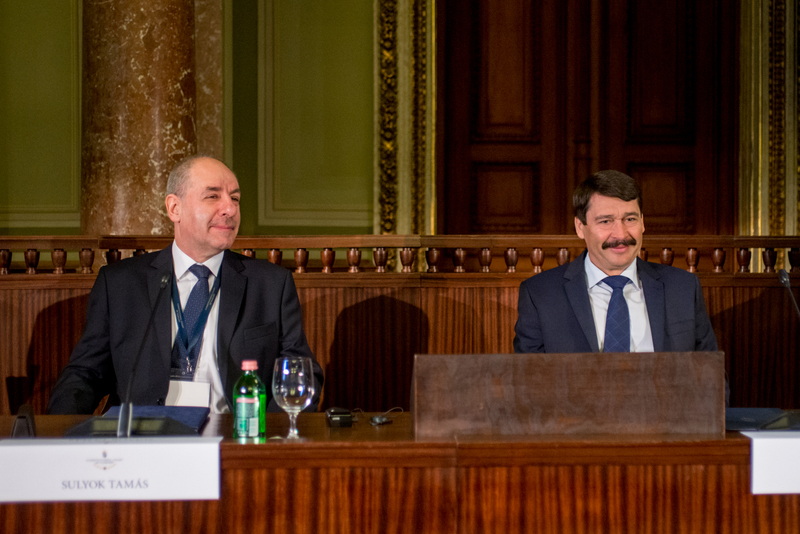 The participants of the conference were welcomed by János Áder, the President of the Republic. He underlined that the fact that in various lectures and studies the concepts of identity, sovereignty and loyalty are often mixed up does not make it easy to define the content of European constitutional identity. By quoting Tamás Sulyok, the President of the Republic recalled: the term constitutional identity is interpreted by the Hungarian Constitutional Court as the constitutional self-identity of Hungary. János Áder added that the Constitutional Court of Germany – often used as a reference point by other constitutional courts – stated in one of its decisions that the primacy of the application of Union law is fundamentally limited by the constitutional identity of the Basic Law. 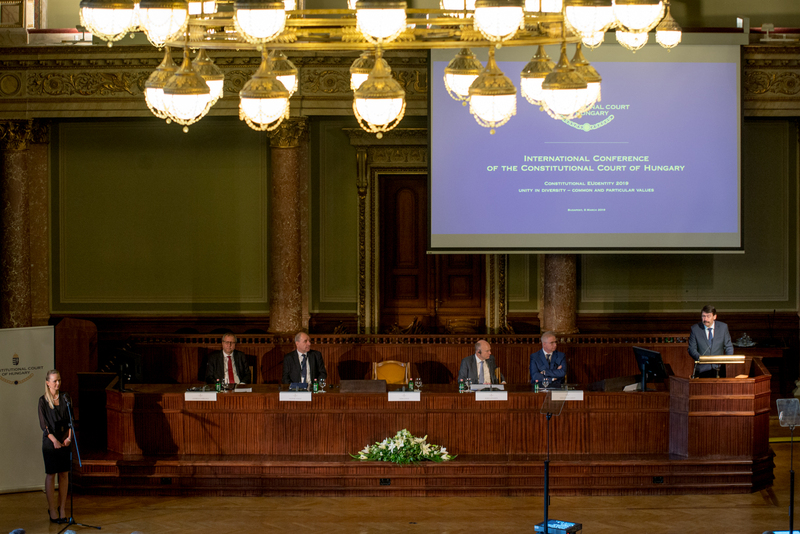 Tamás Sulyok, President of the Constitutional Court emphasized in his welcoming speech: globalisation and the new challenges Europe has to face forecast the need to redefine the essence of European identity. The aim of the conference is to make a contribution to clarifying the legal content of European and national identity. The President also added that our common historical past is the strongest bond between the nations of Europe. It is only up to us whether our common European identity would be formed by conflicts or by constructive dialogue. We need to build a bridge between our European self and our national identity, the same way as we have to find a balance between “global” and “local” aspects, too. This is why the intensive dialogue based on mutual respect between the judicial fora operating in the European space is so topical. Koen Lenaerts, President of the European Court of Justice underlined: European identity reinforces national identity; moreover, it consists of the common values of the Member States. The European Union is based on the equality of the Member States that retain their right to dispose over their national identity. In the areas not regulated by Union law the Member States have a wide margin of discretion to develop their own regulations. Andreas Voßkuhle, President of the German Federal Constitutional Court pointed out in his keynote address: although the concept of a State under the rule of law may differ in the Member States, there are common points and values (human dignity, freedom, acquired rights) that create a strong basis for the rule of law. At present the exact content of European identity is not defined in the European Union and it is our joint responsibility to remedy this deficiency. The president of the German Constitutional Court underlined the importance of the dialogue between the Member States and the European Union, stressing that maintaining a balance between national constitutional identity and the European values is of key importance. According to László Trócsányi, Minister of Justice, mutual respect and communication is needed in the European Union and the partners should be treated equally. This is indispensable for the nurturing and the improvement of integration and for the creation of a globally more powerful European Union. The first five speakers were followed by a series of professional presentations. The chair of the first section was Christoph Grabenwarter, the Vice-President of the Austrian Constitutional Court. The speakers included (in the order of addressing the audience): Peter M. Huber, Justice of the German Federal Constitutional Court, János Martonyi, former Minister of Foreign Affairs, Brigitte Bierlein, President of the Austrian Constitutional Court, István Stumpf, Justice of the Constitutional Court and Maarten Feteris, President of the Supreme Court of the Netherlands. The second section was chaired by Francis Delaporte, Vice-President of the Constitutional Court of Luxembourg. 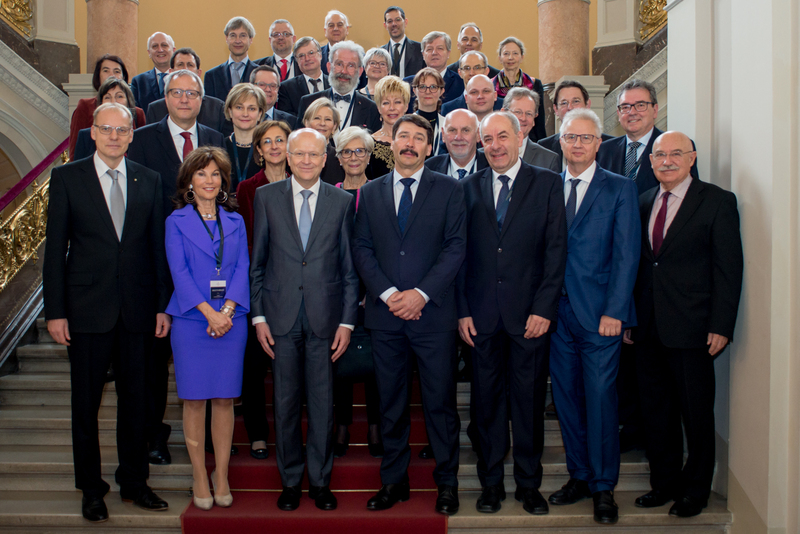 The speakers were (in the order of address): Tamás Sulyok, President of the Constitutional Court, Pavel Rychetsky, President of the Constitutional Court of the Czech Republic, András Varga Zs. Justice of the Constitutional Court, Marta Cartabia, Vice-President of the Constitutional Court of Italy, Ineta Ziemele, President of the Constitutional Court of Latvia, Rajko Knez, President of the Constitutional Court of Slovenia and Marta Niquille, Vice-President of the Federal Supreme Court of Switzerland.